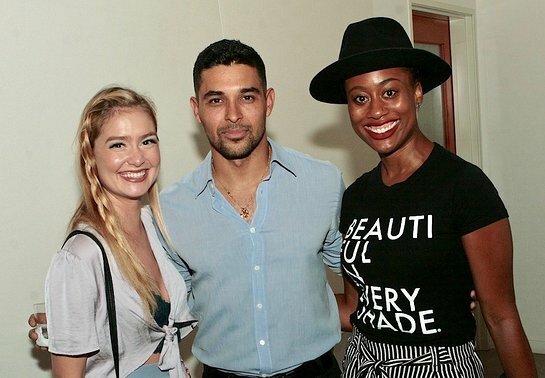 KIND Los Angeles, an exclusive cocktail reception benefitting Kids In Need Of Defense (KIND), was hosted by Wilmer Valderrama at the new BOLON Los Angeles showroom and historic Helms Design Center in Culver City on Saturday, August 4. KIND Los Angeles introduced the LA entertainment, design and philanthropic communities to KIND. The event highlighted KIND’s work protecting and defending immigrant children suffering in detention centers during the current border crisis. KIND provides high quality pro bono legal representation to immigrant children separated from their parents and helps to reunite children with their parents and families. Presented by BOLON and BOOM Events, the cocktail party was hosted by actor and activist Wilmer Valderrama who participated in a special presentation with KIND President Wendy Young; Pulitzer Prize winning journalist Sonia Nazario; and Alejandra Valdez, a teenage former KIND client originally from El Salvador. Guests enjoyed the beautiful atmosphere of BOLON’s spectacular new Los Angeles showroom while learning about KIND and how they are addressing the family separation crisis. Among the notable guests in attendance were Zuri Adele (Freeform’s upcoming “Good Trouble”), Lana Condor (Netflix’s upcoming “To All The Boys I’ve Loved Before”), Bryan Craig (ABC’s upcoming “Grand Hotel”), Elle McLemore (upcoming film “American Dresser”), Sonia Nazario (Pulitzer Prize winner), Goya Robles (“Get Shorty”), Adam Rodriguez (“Criminal Minds”), Gabrielle Ruiz (“Crazy Ex-Girlfriend”), Alicia Sanz (“From Dusk Till Dawn”), Pallavi Sastry (“Blue Bloods”), Azie Tesfai (“Jane The Virgin”), Diego Tinoco (“On My Block”), Alejandra Valdez (former KIND client), Lincoln Younes (ABC’s upcoming “Grand Hotel”), Wendy Young (KIND President), Zeeko Zaki (CBS’s upcoming “F.B.I.”) and more. KIND LOS ANGELES was generously sponsored by BOLON, BOOM events, Helms Design Center, Michael Hollingsworth Catering, Stanley’s Wet Goods and HINT Waters.